Clarity Challenge Blog: Clarity Challenge #43 - In the Garden. Clarity Challenge #43 - In the Garden. From an English country garden to a Japanese Water House. The wonderful Jayne Nestorenko designs would be perfect for this too. with a huge full moon. to excite you with Cherry blossom and our Weeping Ashtree. some of our other Clarity Team members! If you have the ingredients to go Japanesey, brilliant. If you have the Birdhouse Stencil, great. Whatever garden themed Clarity stash you have will be super. Going forward, we will drop several Challenge of the Month themed products into the Offers section on the website. So, if you would like to be in with a chance of winning a £50 Clarity Gift Voucher, then see below on how to enter. Don't forget, you have got be in it to win it!!!! EMAIL - if you don't have a blog you can send a photo of your project via email to us an we’ll enter it for you. Wendy Thorburn is this month’s Guest Designer! Hi there it's Wendy here! 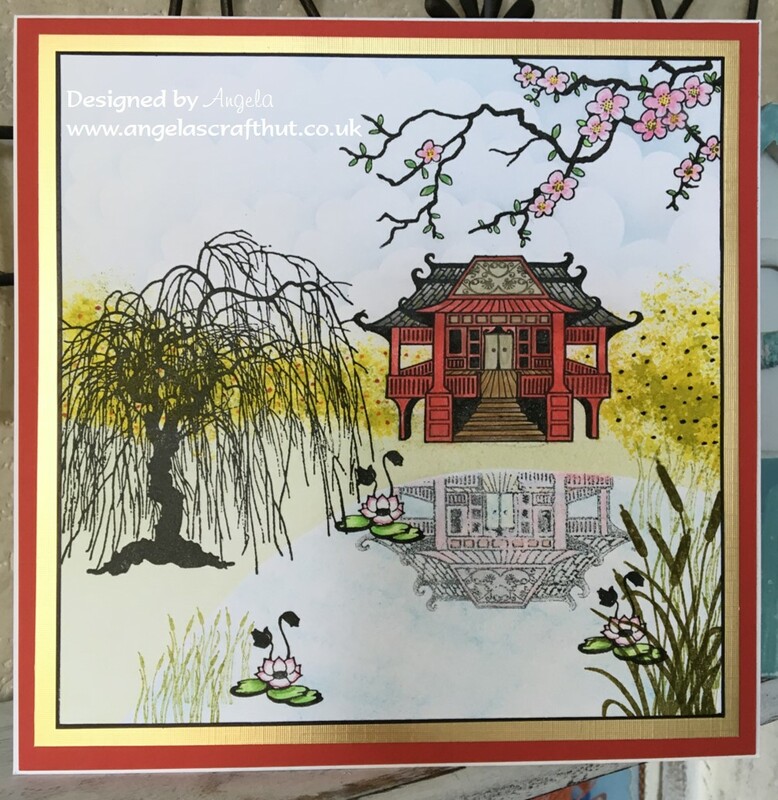 I'm delighted to have won last month’s challenge, and been invited to be a guest designer for September. I've enjoyed doing my artwork for this months challenge, I have been lucky enough to have lots of birds feeding in my garden and the flowers are looking really good this year too so I knew which stamps I wanted to use as soon I was told what the theme was. Now what do I tell you about myself? I'm 50, have been married for 29 years to Stephen who is a wonderful husband and doesn't mind all my crafty stash which has grown over the years.We have a 21 year old son Kieran who is in the army and who I am immensely proud of. Our daughter Rebecca would have been 25 now but she passed away in January 2013. We live in Warminster in Wiltshire not far from Stonehenge and Bath. I have always enjoyed crafting but started rubber stamping when Rebecca was a baby, I needed something else to do other than changing nappies, plumping cushions and being a mum, so joined a Quilling group. A lady came in one week to demonstrate stamping and heat embossing and that was it I was hooked! When Stephen was posted to Warminster in 1998 I started going to craft shows, it was at one in Exeter when I first saw Barbara and was transfixed by what she was doing with a brayer and how she could produce amazing scenes with inks and her stamps. I always made a beeline for her stalls at any shows I then went to. Rebecca suffered a brain injury after contracting viral encephalitis when she was 11 which left her with severe epilepsy, learning difficulties and no short term memory. After a couple of very difficult years trying to cope with Rebecca at home we made the difficult decision to place her at a specialist epilepsy school in Lingfield. We had picked Rebecca up from the school for a day out and popped into an open day the craft shop in the village was holding.I couldn't believe it when I saw Barbara there! I didn't realise she lived not far from there. It was then that we got chatting with Barbara, and her lovely partner Dave. We ended up going round to Barbara's house for tea and meeting the rest of her family and I feel very privileged to say we have been friends ever since. I used to pop in sometimes to have a quick chat and a cuppa before my long journey home after dropping Rebecca back at school after her holidays. One time we sat outside in the sun putting together the stamp boxes just before Barbara was going on the TV for the first time! It has been wonderful to see how well Clarity has done over the years and has just gone from strength to strength. With fabulous stamp and stencil designs and the innovative Groovy system as well as the best customer service and the caring community Barbara has developed, I know it will continue to flourish. It has been in part due to crafting with Clarity and of course my husband that I was able to get through the hard times with Rebecca especially when she died very suddenly. It would seem I was practicing mindfulness with Barbara even before it became popular with the masses so I can definitely say that staying focused and getting lost in crafting really is beneficial so let's keep it going! Hi Wendy - after seeing your name on here and Facebook so many times, it's lovely to see you appearing as guest designer, and get to know a little bit about you. I can vouch for crafting being such a big help through tough times and I know the crafting community provide wonderful support and friendship to us all. That's a pretty piece of artwork to inspire others this month, a beautiful peaceful garden scene. Lovely to meet you and I look forward to seeing all your artwork in future. Congratulations Wendy, really like your garden card. A big thank you to Sazz for processing all our email entries for so long (supported, I think, by Kim Shaw?) - I really appreciate the opportunity to enter without having to have a blog - it must have been a fairly time-consuming task, with so many email entries coming through - and not helped by people like me and Mum who are so often at entering at the very last minute! I hope this hand-over will free up some time for you to allow you to concentrate on your own crafting again - and hopefully we'll see some of your work, either as DT inspiration or maybe even as Challenge entries! Lovely DT samples, as ever - I look forward to seeing more over the coming days/weeks. Yours is a beautiful garden scene, Wendy - that bird-feeder really seems to pop off the page! And, Paul, please forgive us if we have a momentary lapse and address our emails "Dear Saz"!! Ha, ha, ha that made me laugh - I wonder how many people will address their emails to me and not Paul!!!! I've enjoyed bringing the challenge blog to life and encouraging you all to enter each month and of course couldn't have done it recently without my crafty buddy and best friend Kim Shaw. Our friendship was formed through crafting and now she lives up the road from me after moving to Peterborough from London. the power of crafting eh? I can only re-iterate all that Dawn has said. We both enjoy entering the Challenge esch month and appreciate the comments we get from the Design Team, and other Clarity followers. Sazz - You have been a star and Kimmy (your amazing sidekick! soz sis! )Thank you both for all of your help! Paul, you have some very large shoes to follow in - good luck chuck! Your card is lovely and your story is very moving. Thank you for sharing it with us. Sazz - thank you for all your work with the challenge blog and for entering my pieces into the challenges. What a lovely set of people you all are. Well done Wendy and thank you for sharing your story with us. Good luck to all who enter the challenge and thank you Sazz for all you have done to make it possible. Last call for Challenge 43 & Calendar 9! !